Milk Chocolate min, 33% cocoa solids: Sugar, cocoa butter, whole milk powder, emulsifier: soya lecithin, vanillin. Cinder Toffee: Sugar, glucose syrup, bicarbonate of soda, wheat flour. Milk Chocolate min 33% cocoa solids: Sugar, cocoa butter, whole milk powder, emulsifier: soya lecithin, vanillin. Cereals coated with caramel flavoured cocoa based confectionary: blend of milk and white chocolate with caramel flavour (sugar, cocoa butter, caramel powder (condensed whole milk, sugar, glucose syrup, salt, acidity regulator E500ii) whole milk posder, whey powder (milk), cocoa mass, emulsifier soya lecithin, natural flavouring), crisped cereals (wheat flour, sugar, salt, oat flour, wheat malt flour, raising agent E500ii, natural vanilla flavouring), glucose syrup, sugar, glazing agent E414, modified starch, vegetable fat (coconut). Milk Chocolate min 33% cocoa solids: Sugar, cocoa butter, whole milk powder, emulsifier: soya lecithin, vanillin. Brazil nuts, Pecan nuts, roasted hazelnuts. Milk Chocolate min, 33% cocoa solids, White chocolate min 23% cocoa solids: Sugar, cocoa butter, whole milk powder, emulsifier: soya lecithin, vanillin. Marshmallows: glucose fructose syrup, sugar, water, gelatine, anticaking agent: maize starch, flavouring, colours: E100, E120, E131, E162. Plain Chocolate min. 53% cocoa solids: Sugar, cocoa butter, emulsifier: soya lecithin, vanillin. Orange peel, glucose-fructose syrup, saccharose, Acid regulator: E330 (citric acid), Preservative: E220 (sulphur dioxide) Orange oil. Plain Chocolate min. 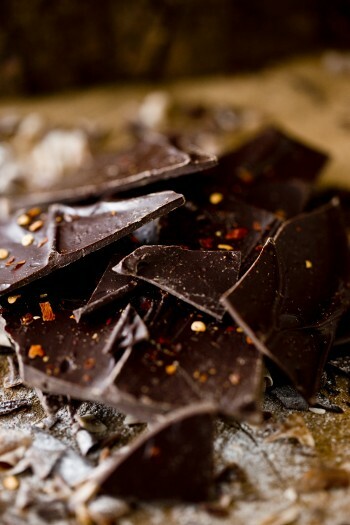 53% cocoa solids: Sugar, cocoa butter, emulsifier: soya lecithin, vanillin, chilli powder, crushed dried red chilli, cinnamon. Mint leaf Fragments: Sugar, natural flavours, mint, acacia gum, flavour, E120, E124, E132. Peppermint essential oil. Plain Chocolate min. 53% cocoa solids: Sugar, cocoa butter, emulsifier: soya lecithin, vanillin, cocoa nibs. Plain Chocolate min. 53% cocoa solids: Sugar, cocoa butter, emulsifier: soya lecithin, vanillin, crystalised ginger (ginger, sugar). Lemon peel (lemon peel, sucrose, fructose, dextrose, maltose, Preservative: potassium sorbate (E202), sodium metabisulphite (E223), acidulant: citric acid (E330). Plain Chocolate min. 53% cocoa solids: Sugar, cocoa butter, emulsifier: soya lecithin, vanillin.Rose petal Fragments: Sugar, natural flavours, rose, acacia gum, flavour, E120, E124, E132. Freeze dried Raspberries, Rose flavour.